The Veneto is a large, beautiful region in northeastern Italy. It reaches northwards into the Dolomite Mountains, where you will find some of Italy’s most exclusive tourist and ski resorts, and westward to Lake Garda with its olive trees and its majestic views. Following along the course of the Brenta River, you will come to Palladio’s splendid villas. Picturesque towns seem to sprout up from the gently rolling hills. Vineyards feed off the water of the Adige river which passes through Verona on its way south to the Venetian lagoon. For nearly 1400 years, the two or three miles of shallow water separating Venice from the mainland of Italy, had not only protected Venice from invaders but effectively isolated the Venetians from Italian politics. Untouched by imperialist warfare, feudalism and territorial squabbles; Venetians fixed their attention on the East and the rich markets of Levantine and Constantinople to become a great mercantile empire called the Venetian Republic. A city built out of fear of invasion, was soon to be known as one of the most beautiful cities in the world. While the Florentines were regarded as great thinkers, the Venetians would be regarded as great doer’s, since they alone conquered Veneto’s malaria-ridden swamps to build a great city, Venice, from nothing. These two grains, rice and corn, are the main ingredients of the region’s first courses, which include many types of risotto and polenta. Rice is a particularly versatile ingredient, and here you will find risotto made with everything from chicken giblets or eel, to fresh peas or radicchio from Treviso or asparagus from Bassano. As you head north towards the mountains, polenta becomes the grain of choice. Polenta is often served with baccalà, a dried salted cod, calf’s liver and onions or braised beef or horsemeat. Along the Adriatic coast, fish soups or brodetti, are traditionally served as first courses. Chioggia, a picturesque costal town located just south of Venice, is particularly famous for its fish soup and its massive fish market. When it comes to dessert, the Veneto is home to one of Italy’s most well known sweet breads, the Pandoro. This rich bread is produced in and around Verona according to an ancient recipes. In Venice, be sure to look for Scalete, Pandolo, and Baicoli, all traditional sweets favored by Venetians. For a seafood lover, there is perhaps no better place in the world to visit than Venice, Italy. The cuisine of this historic city relies heavily on the abundant bounty of the Venetian Lagoon, and the vast array of sea creatures which inhabit it. Every morning, the Rialto Market of Venice is overflowing with exotic catches of the day, from tiny snails called bovoleti to razor clams (cape longhe) and gigantic swordfish. Besides the lagoon, some fresh seafood is obtained from fish farms, or from the mountain streams of the Alto Adige. Wherever the source, the fish of this region is of amazing quality and variety. While in Venice one can sample some of the seafood delicacies of the region found nowhere else in the world. Simply sticking to old Italian staples, such as cheese pizza or spaghetti with meatballs, would be an unfortunate choice, when presented with Venice’s unique dining options. The following list represents some of the most popular seafood dishes found in Venice, today. Preparation of these dishes is generally simple, relying on the quality of the ingredients and basic cooking techniques. Pesce Fritto Misto (Fried Mixed Fish) Typically these mixed-fries will include seafood choices, such as calamari, scallops, small shrimp, some large prawns or a small-sized whole fish. This hearty meal is usually served with Polenta and lemon wedges and, perhaps, no more than a sprinkling of salt and parsley for seasoning. Seppia al Nero (Squid in its Own Ink) Seppia, or cuttlefish, is a squid-like fish which sprays black ink when threatened. The meat of the seppia is sweet and tender when grilled, and is often served in Venetian restaurants over a bed of linguine or risotto, colored black by its ink. The ink gives the pasta or rice a rich, briny flavor. Sarde in Saor (Marinated Sardines) This classic dish is one of the most popular Venetian first courses. Sardines are fried and placed in a sweet-and-sour marinade of vinegar, onions, raisins and pine nuts. If one’s only experience with sardines are those of the canned variety, then trying this specialty of the Venice region is a must. Pizza con Pesce (Seafood Pizza) Seafood pizza in Venice is unlike pizza served anywhere else in the world. It is prepared with a topping of calamari and mixed shellfish such as shrimp, clams and mussels – often still in their shells. The shells open as the pizza bakes in the oven, releasing their juices onto the very thin crust with a tomato sauce base. Of course, there is absolutely no cheese served on such a pizza, as in true Italian cooking, cheese and seafood are considered highly incompatible. Branzino Me Alati (Salt-Crusted Mediterranean Sea Bass) A classic Venetian way to prepare a whole branzino (sea bass) is to bake it in a thick salt crust. 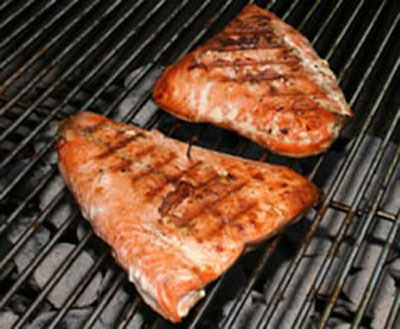 The salt forms a hard shell around the fish while it cooks, and the scales are left on the fish while cooking to prevent the salt from penetrating the flesh. The crust must then be carefully cracked and peeled away before filleting the fish. The resulting flavor is sweet and tender and usually served with risotto or pasta. Folpetti Consi (Boiled Baby Octopus) Tiny young octopus are boiled with carrots and celery until tender, then seasoned lightly with oil, lemon juice, salt and pepper. Rombo, also known as Turbot, is a uniquely Mediterranean fish, not unlike the flounder. 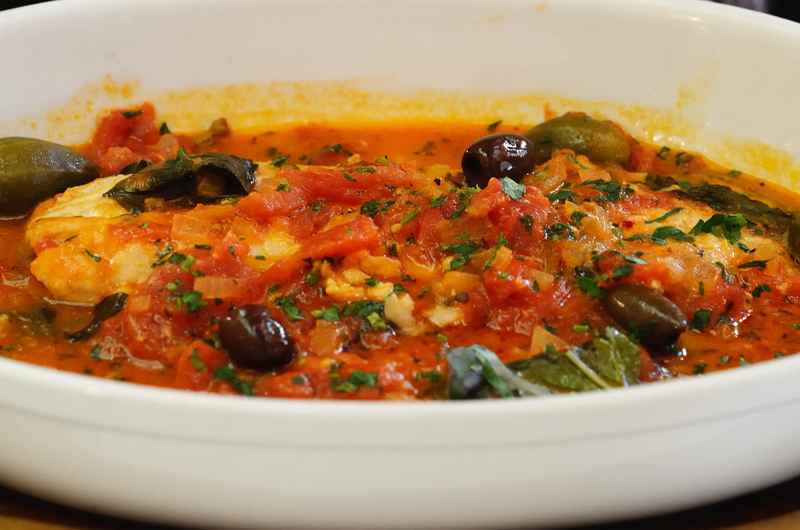 It is a flat fish that is quite popular in Venetian restaurants for its delicate flavor. It can be prepared in a number of different ways, but it is usually baked in a light tomato sauce. Risi e bisi (rice and peas) is a classic Venetian dish. In the past it was prepared only on the feast days decreed by the Doge (Venice’s ruler), and though one can now prepare risi e bisi at any time, the dish really shines when freshly harvested baby peas are available. However, quality frozen peas can work very well, if fresh peas are not available. Venetians use a risotto rice called Vialone Nano, but Arborio rice will be fine if the Venetian rice is not available in your area. Bring vegetable stock to a simmer in a saucepan. Cover and keep warm. Melt 1 tablespoon butter with 1 tablespoon oil in a large heavy pot over medium heat. Add onion and sauté until soft (do not brown), about 5 minutes. Add pancetta and cook until light brown, about 3 minutes. Add rice and cook, stirring until coated, about 1 minute. Add 1 cup stock. Stir constantly until stock is almost absorbed, about 1 minute. Continue adding stock by the cupful in 5 more additions, stirring constantly and allowing stock to be absorbed between additions, until rice is almost tender. Add peas and remaining cup of stock and cook, stirring constantly, until the rice is creamy and tender but still firm to the bite, about 22 minutes total. Remove pan from heat. Stir in the remaining 1 tablespoon butter, Parmesan, and parsley. Season rice and peas with salt and pepper. Transfer to serving bowls or plates, and serve. 1. To cook fillets: Heat olive oil and butter in a large sauté pan over medium heat. 2. In a separate dish, combine flour, salt and pepper. Flour the fillets and place in the sauté pan. Cook until golden brown on each side. Remove to a serving platter. 3. Keep the drippings in the sauté pan and add the parsley, capers and wine. Cook over a low flame for 3 minutes. 4. Spoon the sauce over the fillets and serve immediately. Pork Stewed in Milk is one of the most popular second course entrees in the restaurants of the Venice, and, as a result, there are many variations. Some use white wine vinegar rather than white wine, others omit the garlic, and others use pork loin rather than pork rump. Tie the meat with butcher’s twine to give it as regular a shape as possible, and put it in a pot that’s just large enough to hold it. Add good, but not too strong or acidic white wine vinegar to cover, cover the pot with a cloth, and set it in the refrigerator for 48 hours, turning the meat four times each day and adding more vinegar if need be to keep it covered. When the time is up, remove the meat from the vinegar and dry it well. Flour it and brown it in the butter, turning it so as to brown all sides. In the meantime, heat the milk, and, while the meat is browning, tie together the sage leaves and rosemary. Add the herbs to the pot, and season the meat with salt and pepper; next, slowly pour the milk over it. Let it come back to a boil, reduce the heat to a slow simmer, cover the pot, and cook for two hours, turning the meat every now and again, but being careful not to puncture it. Half way through the cooking, add a large clove of peeled, crushed garlic. By the time the meat is done the milk will have condensed into a creamy sauce. Slice the meat fairly thickly, arrange the slices on a heated serving dish, spoon the sauce over them. If calamari and black squid ink are not your thing, I would use small shrimp or bay scallops for the calamari and 1 tablespoon basil pesto for the squid ink. To make gnocchi: Scrub the potatoes and place, unpeeled, in a large pot of boiling water (lightly salted). Cook for 45 minutes until tender but not overcooked. When cool, peel potatoes and mash. Add flour, eggs, salt and pepper. Roll dough into long thin rods, and cut into small pieces about 1-inch in length to form the dumplings. Bring a large pot of lightly salted water to a boil. Drop gnocchi in and cook for approximately 1 minute until they float to the top. Scoop out with a mesh strainer. To make Salsa Nera: In a large sauté pan over medium heat, add olive oil and garlic and cook for 3 minutes. Add parsley, tomato paste, white wine, black squid ink (or pesto), salt and pepper; cook for 20 minutes then add the calamari ( or shrimp or scallops) and cook for 3 minutes more. To assemble: Place cooked gnocchi on a large serving platter. Add the salsa nera and gently toss to cover gnocchi with sauce. 1. To make crepes: In a large mixing bowl, add the flour, sugar, salt, milk, eggs, butter and vanilla extract. Whisk batter well to remove any lumps, and then let the batter rest for at least 1 hour to ensure tender crêpes. 2. In a small, flat, round crêpe pan, heat the pan over medium heat and grease lightly with butter to prevent sticking. 3. With a ladle or small measuring cup, quickly pour a small amount of batter into the pan. Immediately tilt and swirl the pan to spread the batter in a thin, even layer that just covers the bottom of the pan. Cook for a few minutes, and then check the doneness of a crepe by carefully lifting one edge and looking underneath it for a golden color with specks of light brown. With a spatula, loosen the edge of the crêpe from the pan, flip it over, and cook on the other side until golden, about 30 seconds. Set aside crepes on individual dessert plates. 4. To make berry sauce: Melt butter in a sauté pan large enough to hold all of the ingredients. Add sugar and cook until it begins to caramelize. Add orange juice and reduce by half. Add berries and heat through. 5. To assemble: Once berries are hot, add the cognac, and ignite. Spoon over crepes and serve immediately. Do you eat the same food for three to four days in a row or eat the same food at the same meal day after day? Perhaps you eat peanut butter and jelly sandwiches for lunch every day. Or you always eat peanuts for a snack. Sound familiar? It’s so easy to fall into an eating rut. Having the same breakfast, lunch, or dinner, day in and day out, offers convenience and comfort. No need to think about what to eat or where to find it.There are no surprises when you pour yourself a bowl of the same cereal for breakfast day after day. The foods people get hooked on are the usual — burger and fries, chips and soda and pepperoni pizza. Rarely do you hear of anyone stuck on broccoli for days or months. That doesn’t mean that eating the same thing again and again has to be unhealthy. One person who made an eating rut work to his advantage was Jared Fogel of Subway fame. In less than a year, he says, he lost 235 pounds on a diet of coffee for breakfast; a 6-inch low-fat turkey sub with extra veggies, baked chips, and diet soda for lunch; and a 12-inch veggie sub for dinner. Don’t say “Yuck” when friends want to try an ethnic restaurant that serves unfamiliar cuisine. Heat 2 tablespoons oil in a large skillet over medium heat. Add garlic; cook 3 minutes or until golden, stirring frequently. Stir in clam juice and next 5 ingredients (clam juice through clams). Cover and cook 10 minutes or until clams open. Place pasta in a large bowl. Add 2 tablespoons oil; toss well to coat. Add clam mixture to pasta; toss again. Wash the sliced leek well in a bowl of cold water, agitating it, then lift out and pat dry. Set aside. Combine the undrained clams, 1 1/2 tablespoons oil and wine in a small bowl. Bring a large pot of salted water to a boil. Cook pasta in the boiling water until al dente. Drain and set aside (do not rinse). In a large skillet, heat remaining 2 tablespoons oil over medium heat. Add leek, carrot and bell pepper; cook, stirring frequently, 5 minutes. Add tomatoes, garlic and 1/4 teaspoon salt. Cook 30 seconds; add clam mixture; gently simmer until carrot is tender, about 5 minutes. Then add cooked pasta and parsley; toss just to combine. Top with plenty of fresh cracked pepper. Remove from heat. Heat a nonstick skillet over medium heat. Coat pan with nonstick cooking spray, add butter, then the onion and red pepper. Cook until softened, stirring occasionally about 4 minutes. Stir in 1/2 teaspoon of Old Bay, 1/8 teaspoon of the salt and the light cream. Increase heat to medium high and bring to boil; cook for 1 minute or until thickened. Gently fold in crabmeat and 2 teaspoons of the parsley. Refrigerate 30 minutes. Heat oven to 400 degrees. Coat a 13×9 inch baking dish with cooking spray. Place one of the flounder fillets, skinned-side up on work surface, then spoon 1/2 cup crab mixture onto one end of fillet; roll up, creating a small bundle. Repeat using remaining fillets and crab. Transfer bundles to baking dish, seam side down, and sprinkle with remaining 1/4 teaspoon Old Bay, 1/8 teaspoon salt and 1 teaspoon parsley. Add wine to the pan; transfer to the oven. Bake for 20 minutes or until fish is solid white and flakes easily with a fork. Preheat oven to 375 degrees F. Coat a baking dish with nonstick cooking spray. In a medium bowl combine all the stuffing ingredients. Spoon about 1/2 cup stuffing onto each fillet; roll up. Place seam side down in baking dish. Combine the butter and lemon juice and drizzle over the fish rolls. Sprinkle with paprika and parsley. Bake, uncovered, at 375° for 20-25 minutes or until fish flakes easily with a fork. Preheat oven to 375 degrees F. Spray a 9x13x2 inch baking dish with olive oil cooking spray. Heat oil in large saucepan and add garlic, basil, tomatoes, tomato paste, seasonings, salt and pepper. Simmer uncovered for 1 hour, stirring occasionally. Beat eggs. Add ricotta and parmesan cheeses, salt and parsley. Refrigerate until needed. Bring a large pot of water to a boil, add salt and cook lasagna noodles according to package directions. Drain. Spread ½ cup sauce on the bottom of the baking dish. Top with 3 noodles, 1/3 ricotta mixture, 1/3 mozzarella, and 1/4 of the sauce. Repeat 2 more times. Top the last 3 noodles with sauce and cover tightly with foil. Bake 45 min. Let stand 15 minutes before cutting. In a small bowl, combine ricotta, Parmesan, and the 2 teaspoons oil; season with salt and pepper. In a large pot of boiling salted water, cook noodles according to package instructions; drain and separate on kitchen towels. Cut each noodle in half. Meanwhile, in a large skillet, heat 1 tablespoon oil over medium-high. Add garlic and tomatoes; season with salt and pepper. Cook, stirring, until slightly broken down, about 3 minutes. Transfer tomatoes to a bowl. Add zucchini to the skillet; season with salt and pepper. Cook, stirring, until zucchini are tender, about 5 minutes. Transfer to another bowl and stir in basil. Place some tomatoes in each of four pasta bowls; top with a noodle and a spoonful of ricotta, some zucchini, and more tomatoes. Repeat layering twice, then top with remaining noodles and tomatoes. Garnish with basil. Grill steak 8 to 10 min. on each side or until medium rare to medium (125 to 130 degrees), brushing with barbecue sauce mixture after turning steak. Let rest 5 minutes before slicing. In a roasting pan, combine the mushrooms, celery, lemon slices, onion, oil, and 1/4 teaspoon each salt and pepper. Season the steak with 1/2 teaspoon each of salt and pepper, rub in the garlic and place steak on top of the vegetables. In a small bowl, whisk together the ketchup, lemon juice and Worcestershire sauce. Spoon the ketchup mixture over the top of the steak and roast 30 to 35 minutes for medium-rare (when a meat thermometer registers 125°F). Transfer the meat to a cutting board and let rest at least 5 minutes before slicing. Serve the steak with the vegetables. Slice the tomatoes 1/4-inch thick. Lay them out in a shallow baking pan and sprinkle with salt. Place the tomato slices in a colander and allow time for the salt to pull the water out of the tomatoes, approximately 30 minutes. Drain on paper towels. Add pepper to the self-rising flour in a shallow bowl. Pour buttermilk into another shallow bowl. In a large skillet for deep-frying, heat the oil over medium-high heat. Dip the tomatoes into buttermilk, then dredge them into flour. Deep-fry until golden brown. Drain on paper towels. Serve with the Remoulade Sauce. Combine mayonnaise and remaining ingredients in a small bowl; stir with a whisk. Chill. Preheat oven to 400° F. Spray a baking sheet with cooking spray. Sprinkle the tomato slices lightly with sea salt. Combine bread crumbs, olive oil, water, garlic, and Parmesan cheese in a small bowl. Place tomato slices in a single layer on the baking sheet. Divide the crumb mixture evenly over each tomato slice. Bake about 20 minutes or until brown and crispy. Serve with Onion Relish. Add garlic and rosemary; cook, stirring, until fragrant, about 1 minute. Add 1/4 cup vinegar and cook until most of the liquid has evaporated, about 3 minutes. Season with salt, pepper and more vinegar, if desired.